In the heartland of the country sits the City of St. Louis, home of the Rams from 1995 until 2015. Professional football in the city dates to 1960, when the NFL Cardinals moved from Chicago to St. Louis. From 1966 until 1987, the football Cardinals played at Busch Stadium, a multipurpose stadium in downtown St. Louis that was also the home baseball’s St. Louis Cardinals. Throughout the 1980s, the Cardinals (NFL) were one of the worst teams in the league and struggled to attract fans to Busch Stadium. Owner of the Cardinals (NFL), Bill Bidwill, wanted a new stadium built in downtown St. Louis because Busch Stadium was to small. City officials wanted to build a stadium in the city, while county officials wanted it built in the county. St. Louis County bought 100 acres of land along the Missouri River, planning a 70,000 seat dome stadium. However, after years of political wrangling over where a stadium should be built, Bidwill moved the Cardinals to Arizona and Sun Devil Stadium after the 1987 season. In 1988, for the first time since 1960, the City of St. Louis lacked a professional football team. After the Cardinals departure, officials began to seek either an expansion franchise or lure an existing team to the city. In 1991, the NFL announced they would expand by two teams. Five cities were in contention for the two teams including Charlotte, St. Louis, Baltimore, Memphis and Jacksonville. St. Louis was considered a front-runner, because it was the largest city without a football team. By the early 1990s, a new stadium-convention center was planned in order to show the city’s commitment to bringing football back to St. Louis. In spring 1993 construction began on a 66,000 dome stadium in downtown St. Louis. It appeared that the city was a lock to land an expansion team with construction underway on a stadium. However in October 1993, city’s dreams of attracting an expansion franchise were shattered when the NFL awarded Charlotte and Jacksonville teams. Construction of the Rams new stadium in St. Louis was expected to be completed by the 1995 season, but delays forced the team to play at Busch Stadium for several games. The St. Louis Rams’ first game at the Edward Jones Dome was on November 12, 1995. Over 66,000 seats in three tiers circle the entire field. Edward Jones Dome has 6,300 club seats and 125 luxury suites. The facade of the stadium consists of brick and glass. Fans enter the stadium through one of the four entry points in each corner of the building, each with its own spacious glass atrium and escalators. A ring of fame is located inside the stadium containing the retired numbers of Rams Hall of Famers. The stadium has changed names several times, from the TWA Dome to the Dome at America’s Center, to its present day name, the Edward Jones Dome. Edward Jones purchased the naming rights in January 2002, for $2.65 million a year. It is part of the expanded America’s Center convention complex. This complex, along with Edward Jones Dome, hosts many other events besides football, including concerts and conventions. The stadium can be transformed into a convention center very quickly. A “Magic Turf” system allows the football field to be rolled up in an hour. The lighting gridiron can also be lowered to make the area more unique. After the 2004 season, the Rams installed Fieldturf and upgraded the video/scoreboards. In May 2012 the Rams unveiled a proposal to upgrade the Edward Jones Dome. The team’s contract with the St. Louis Convention and Visitors Commission mandated the Edward Jones Dome remain among the top eight NFL stadiums or the team could break their lease at certain junctures, beginning after the 2014 season. In January 2015, owner of the Rams, Stan Kroenke, announced plans to build a 80,000 seat NFL stadium in Inglewood, CA, just outside Los Angeles. 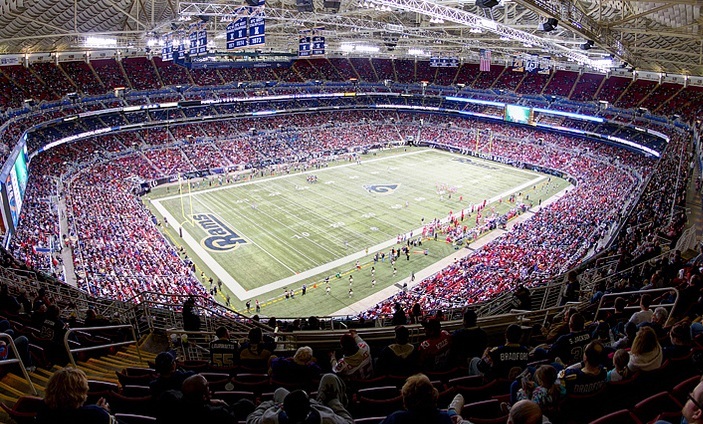 The 2015 season marked the Rams last season in St. Louis and the Edward Jones Dome. On January 12, 2016 NFL owners voted to allow the Rams to move to Los Angeles for the 2016 season. The Rams final game at the Edward Jones Dome was on December 17, 2015 against the Tampa Bay Buccaneers. Now known as the Dome at America’s Center, the facility today remains the site of major performances and shows.